"Fun way to get an early start to a healthy new year!" My son has been wanting to explore Belle Isle (and grab a new long sleeve shirt ;-) so this race was an easy pitch! Thankfully the temperature was pretty mild as December days go, or the wind whipping around the island would not have been pleasant. I understand the wind was strong enough to slow down even the fast finishers, though that wasn't our team--we were happy to be exploring Detroit and watching the sun set over the Ren Cen. Couldn't beat the scenery! My son loved the athletic fabric of the race shirt, as did I--though a smaller size for women would have been nice. That's the only possible ding for this race as parking was close, announcements were clear, and food was plentiful! I understand there was even a "bar" set up on the second floor of the Belle Isle Casino, courtesy of Atwater Brewing--a popular Detroit brewery I've enjoyed on previous visits to town. The event includes a fun run, complete with trophies for the kiddos. It was fun to learn during the announcements that the race started with some parents rounding up kids in Grosse Pointe to run during the holidays, and 47 years later it has grown into quite the event. In fact, it's now the longest continuously-held running event in Michigan! A special bonus was getting to meet fellow #BibRavePro, Jeph Maags. He can give you the review of what things looked like from the front of the pack--you'd never know it was his first 5k! Way to go Jeph! Changed it up with the distance this year to run the 5k with my son, and had a blast! If you're looking for the scenic route, the half is a better bet as it runs along the Huron River on one of the prettiest stretches of road in Washtenaw County. With the 5k even though you don't run through Ann Arbor's fun downtown, chances are you'll get a good chance to experience it as that's where you'll be parking and starting the race. If you're a foodie, plan to stick around post-race, as this race is typically held the same weekend as two downtown food events: the "Zingerman's Camp Bacon" fair and "A Taste of Ann Arbor". Both are easy walking distance from the finish. At Camp Bacon you'll get free samples of everything bacon for a donation to the local 4-H club (held in Kerrytown in conjunction with the Farmer's Market), and at Taste of Ann Arbor where you can sample treats from over 30 area restaurants with tickets purchased for $1 each, with "tastes" ranging from 1-4 tickets (held on N. Main, just down from the finish line). Oh, and there's also the finish line food: water, Gatorade, bananas, oranges, bread & bagels (from Zingerman's! ), pizza, and I believe there's a beer tent as well. Finisher's swag is a t-shirt and medal, usually a nice big heavy one. The t-shirts are a pretty blue this year, and I'm glad they stuck with same sizing where a ladies small is truly small. Yeah for shirts that fit! All in all, in a fun, well-run race that I happily recommend! "Splurge for the VIP package & make it a #runcation!" T-Shirts/SWAG: Love that the bag was reusable and not another plastic throw-away. The VIP package included an Adidas tech half-zip with thumbholes which I'll get a ton of use out of! (And it still had the $60 price tag on it, so you know you're getting value for your VIP ticket. ;-) The shirts we all got were comfy--I've just got a pet peeve about race shirts that blend into the pavement, so I'd vote for "anything but gray" in the future. And the medal--it's HUGE! If you're a collector, this is definitely a race to put on your list. Post Race Food: I feel like food deserves its own star rating, and this one would get 6 out of 5. Every runner got a ticket for beer, champagne, a margarita, and pizza. That's crazy! Plus, the VIP tent included catered breakfast and lunch! I don't know how a person could eat/drink all of that after a race. Unfortunately, I didn't even get to make an attempt to eat all of the foodz because the after party was canceled due to the weather. Next time! Course Scenery: It was such lousy weather it's hard to say what the course would be like on a nice day, though we went through some cute, distinct areas of town so it feels like they did a nice job of showing off the town through the run. Expo Quality: I'm not a fan of large expos you have to "wade" through; I just like knowing there's enough at the expo that I can cover any "last minute" (read "forgot-to-pack) needs. This expo was "just right" from that perspective. They had a wide selection of gear and apparel, though much of the apparel was Columbus themed. I feel like there's an opportunity there for more generic/fun running shirts. Personally, I splurged and picked up an Addaday massage roller that I've been hearing about on podcasts lately. Love it! Elevation Difficulty: If there were any big hills I didn't find them on the shortened course (due to weather) that we ran. Talking to others, I understand this is a great race to PR on, and that would be true looking at my splits through all of the race we did get to run--I was PRing every intermediate distance according to Strava! Parking/Access: We took the easy way out and used the valet parking for the hotel even though it wasn't cheap. We were coming and going a lot to the expo, out to eat for an anniversary dinner, etc. so the valet was a worthwhile convenience for our #runcation. It was also a huge bonus to be at the race hotel and pretty much walk out the front door to the race start. There are parking garages nearby, and the VIP package included parking if you were going to use the garages. Would I recommend? YES! I can't think of a better race for a #runcation with all of the VIP perks. It would be a great race to gather a couple of good friends and enjoy the most pampered half ever, together! "A wet but happy PR kind of day!" Overall: This race had a couple of big pluses for me that helped carry the day even though the weather was less than stellar. I've never run a 15k before, so that meant a guaranteed PR. ;-) In addition, one of the many cities the Hot Chocolate Race is held in happens to be Minneapolis, where I've got an awesome group of triathlon friends, so it was the perfect "excuse" to go spend some together. Aid Stations: As you'll see in #HC15K reviews from other cities, this race series is known for its chocolate goodies at aid stations. For some reason that didn't happen at this race (though the regulars said it ususally does), so it must have been rain related.(?) There was also some snafu that left some aid stations without nuun, which is a little harder to understand given nuun is a sponsor. Parking/Access: Because I had the good forture of attending with locals, they knew eactly where to search for on street parking. I think it was as easy as it could have been given the area the race is held in. I heard people trading tips afterwards about taking public transportation back to the Mall of America where some people were staying, and they didn't know there was a light rail option in town. So the race might do more to promote that and perhaps ease congestion a little bit in the neighboorhoods aroud the race. Race Management: I'm seriously impressed with the group that put on the #HC15k. There's some really fun swag available from their store for training in (who wouldn't "Run for Chocolate", after all? ), and their team is super fast at shipping out and sending notfications, etc. I loved the option to have the packet mailed and wish more races would add that feature. Being a detail oriented person, I also loved the amount of information about the race on the website. Any question I could think of was answered on the site. Logisticially, everything was clearly professionally managed as well--tents well laid out and helpful staff available everywhere you turned. Post-Race Food: I feel like this deserves its own rating, and I'd give it a 4. The gianourmous bowl of dipping chocolate and goodies along with hot chocolate is pretty hard to beat! I just wish there had been a water station near the chocolate goodies, but that's my bad for not realizing I had needed to pick it up on the other side of the park. This is definetly a race I'd recommend to anyone--especialy to anyone who loves chocolate or is seeking a PR in a new distance. I'd also recommend staying tuned to BibRave for special offers when registering for the race! This year it was a great visor that I've already used in another race. "PRs & Packzki, Oh My!" 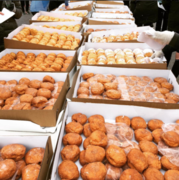 We seem to have developed a pattern in our family where we run for food ;-), and paczki was deemed worthy enough to make the trip into Detroit--our furthest drive for a family race yet. That was even before the kids learned this isn't a typical early race--the start time is 10 am--great for a family run. Getting there was easy, parking a little less so. An extra volunteer or two directing traffic would have been a bonus. We tried parking in the shopping mall, and found that the rows dead-ended, making for fun 12 point turnarounds while cars piled up behind you doomed to the same fate. We wound up parking in a large business parking lot nearby, and I'm not sure there's where we should have been, so I'll have to study up a bit more on parking alternatives for next time around. Post race, paczki is provided by New Martha Washington Bakery & New Palace Bakery, and there's also local beer from Motor City Brewing Works. One of the funniest points of the run was turning the last corner to the finish line, where a volunteer urged us to hurry because they were almost out of beer. ;-) I hope they were well stocked, because there was quite a line to the beer tent! Another bonus of this race is that it raises money for the Hamtramck DDA - $7,500 since 2013. It's always nice to know a race is giving back to the community! All in all, we had a great time at this race and would enjoy running for packzi again!